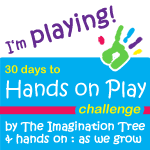 Day 2 of the 30 Day Challenge with The Imagination Tree and Hands on: as we grow is Building a Fort. Now over the summer we built one in the garden regularly to provide some shade but I have never built one indoors with J and T. So this was a great opportunity and today was perfect as it was horrid outside – that drizzle rain where you get completely soaked. 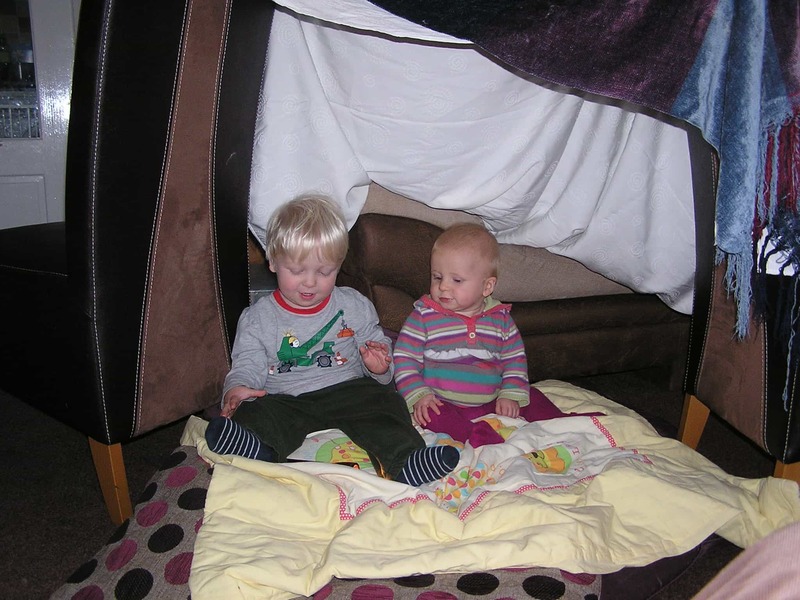 To build our fort – for ever known as a TENT in our house we used 2 dinning chairs, a throw, a table cloth, all the cushions from the sofa’s in the lounge and the baby quilt. It was also essential that we had the “Magic Light” – the Mag Light. 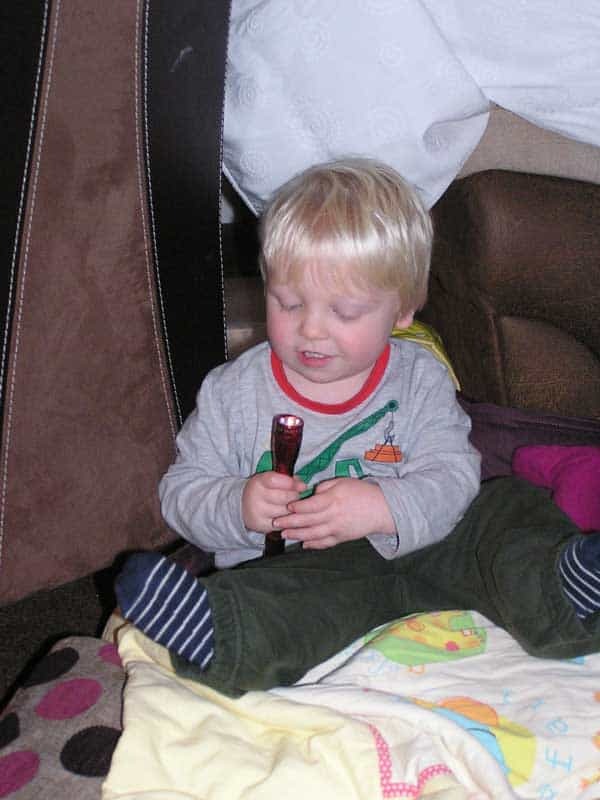 What amazed me is that J was so excited as I started to move furniture, shouting “We’re building a tent”, as soon as it was built he was inside it with his Magic Light shinning it on his face, hiding it and popping up saying “Where’s the magic light gone”. T got put in the tent as well and she loved it as well, I think for her at almost 8 months she loved being included. The play moved on to reading and one of our 5 a day books was brought in and J read it to T helping her press the button. T then crawled out of the tent backwards through a small tunnel that she knocked out with her feet. But very soon she was put back in by me as J insisted and was about to carry her by her head. Once we had read the book a few times – it was then bedtime for me and I was instructed “BED Mummy, go to sleep” only to be woken up within a few seconds by “Wake up Mummy” this went on for ages. 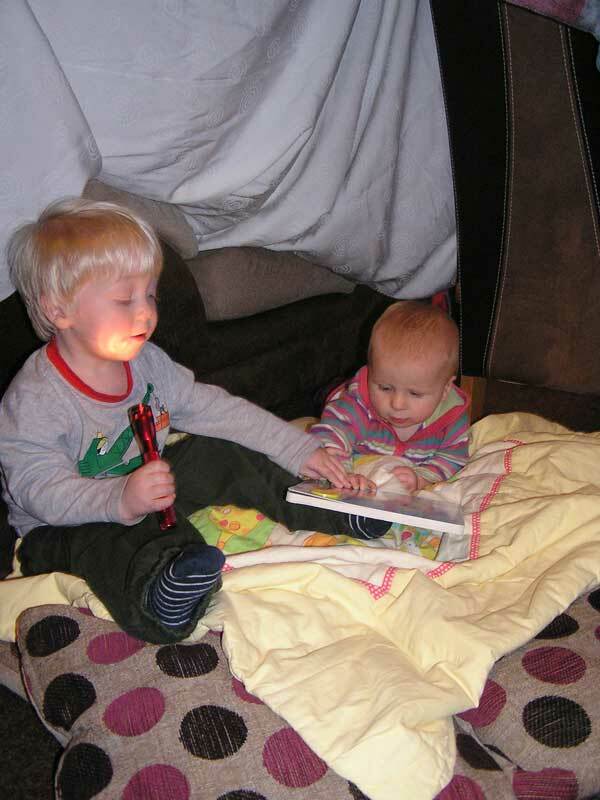 It was amazing to see for the first time J really wanting to interact with T and play with her and include her in our play as well as him lead the play, first with the Mag Light and then with the reading as well as the role play of bedtime and mornings. T I think loved being close to her brother and being included in the games as well – she giggled and laughed the whole time. When Rainy Day Dad got home from work he was shown the tent and sent to bed in it as well. Our 15 mins lasted a lot longer than 15 mins and an hour and a half later we were still playing in the tent although it was more me watching J and T interact by then and RDD cook dinner for us all. Day 3 of the 30 Day Challenge is Building Blocks – find out more about the Challenge on The Imagination Tree, Block play is something that I do a lot with J and T and recently wrote about the imagination of block play after our zoo visit. Tomorrow after playgroup I will put aside 15 mins at least to play with J and T with our blocks. So sweet! Love the light addition. Both my kids would love it!! !